← Like Texas, California Once Had A Maternal Mortality Crisis. Here’s How The State Solved It. You can find yours on the Texas Secretary of State’s site. How those voting locations are determined didn’t make a lot of sense to one of our listeners. 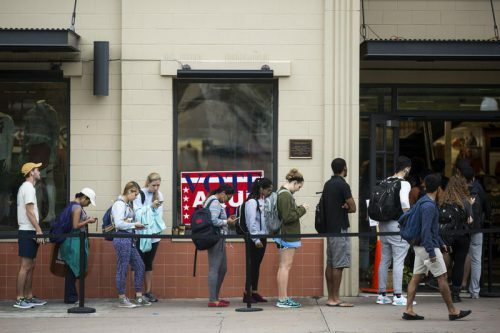 “I’ve always wondered why the polling locations seem to be so random, hard to find, and the lines are very long,” said Carissa Fabian, a civil engineer from Cypress, Texas. Fabian said she thinks about this every time she goes to vote. “You’re standing there wondering why the lines are so long, and why couldn’t it be easier for us to get out and vote,” she said. To start unpacking this, I called on University of Texas at Arlington political science professor Rebecca Deen. She said if we’re talking about a primary election, the party chairs get to decide where those polling places are going to be. For those officials, though, picking the right size of venue is tricky. A government office? A gym? Deen said there’s some indication that this year’s primaries may draw bigger crowds than usual — but who knows. “In some ways it’s a guessing game on how many voters they think are going to come to the polls based on previous elections of those kinds, and then they make a determination,” Deen said. If they’re off the mark, well, that means longer waits. So that was the academic take on the question. For the view from the ground, I went to David Bernstein, the elections director for the Dallas County Republican Party. We met up at one Election Day polling site: a Dallas church. Bernstein estimates he’s in charge of about 250 locations across the county. Designing a system that actually works that way isn’t easy. He says he understands Fabian’s annoyance. Primary elections in Texas are known for their low voter turnout. Sometimes, parties have to consolidate precincts; put Democrats on one side of the gym and Republicans on the other. Bernstein said it’s ideal to have people on both sides going to the same location. He’s tried to streamline things, but admits no setup is perfect. So, that’s where we are today. And she’s not too far off. Bernstein also imagines easier ways to vote. In 2016, there were a few cases of election fraud in Dallas County. So until that day, when Texas Republicans and Democrats can agree on an overhaul of how we do things here, Fabian’s dream of a Texas where voting is easier and polling places easy to find won’t come true. And she’ll still probably have to wait in line. This entry was posted in KRTS News, KXWT News and tagged 2018 primary election, TXDecides. Bookmark the permalink.